On November 27th, 2015, at approximately 10:25 a.m., Dubuque Police responded to a robbery at DuTrac Community Credit Union at 380 East 14th Street. Upon arrival officers were informed that a male suspect entered the credit union, approached a teller and passed a note indicating he was armed with a weapon and demanded money. The teller complied and the suspect fled with an undisclosed amount of money. No weapon was displayed and no one was injured. As part of the investigation, area surveillance and traffic camera footage was reviewed and showed a suspicious vehicle in the area of DuTrac during the robbery. 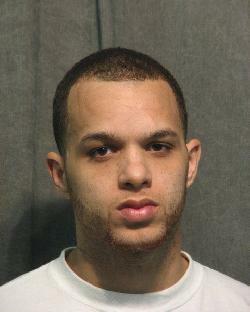 This footage also helped facilitate identifying a suspect, Shawn A. Cade Jr., 28, of 7811½ 8th Street, Rock Island, IL. East Moline (IL) authorities were contacted and assisted in obtaining critical information and evidence supporting Cade’s identity and involvement in the robbery. As a result of the above investigation, an arrest warrant carrying a $50,000 cash bond was issued for Cade, charging him with 2nd Degree Robbery. Cade was subsequently located and arrested by Moline (IL) Police on December 1st, 2015 and is being held in their jurisdiction pending extradition back to Dubuque. The assistance rendered by both East Moline and Moline law enforcement personnel is greatly appreciated. Robbery in the 2nd Degree is a Class C Felony punishable by up to 10 years in prison and a fine between $1,000 & $10,000. As with any criminal case, the charges filed are allegations and any suspects are presumed innocent until convicted in a court of law.